I have a little thing for a man other than my husband. He's funny, kind, helpful, extremely intelligent and not too bad looking. Oh, and I forgot to mention he's RICH and married. Okay, okay, I'll spill the beans. 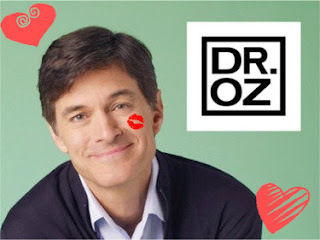 I sort of big squishy heart Dr. Oz. I DVR all episodes. I rewind over and over. I take notes. I call my friends to discuss what I've learned. I share about it on Facebook. I think I may have issues. Who am I kidding?! Of course, I have issues. That's why I watch Dr. Oz. My own doctor just loves that I come to him with my own diagnosed issues thanks to Dr. Oz. I've learned lots of stuff over the years. I even wrote about him on my own blog long ago when I actually blogged on my own blog. I still use the Stridex pads on my feet and the alpha-hydroxy on my face. (I use Walgreen's brand and love it.) 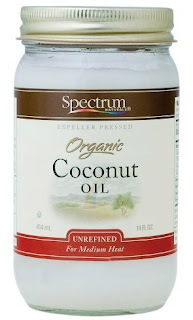 Another product Dr. Oz has talked about quite a bit recently is coconut oil. I finally bought some about a month ago. I'm in LOVE with it. I bought it mainly to try on my scalp because it's been so dry. Coconut oil comes in a solid form. I put some in a little glass bowl and then set the bowl in some hot water until it melted. I then started rubbing the oil onto my scalp. As my scalp started feeling less tight, I noticed my face felt tight and dry so I kept going, rubbing it on my face. I didn't stop there. No, I didn't stop until I'd covered my whole body in the stuff. Wow-wee! I now keep a little bowl of it in our bathrooms for us to use. I no longer melt it, unless I'm putting it on my scalp. I use it to take my make up off, even my eye make up. No need for moisturizer really, my face feels super smooth. I went from just using it on myself to using it when I cooked. It's a super replacement for butter. I melt a little in the skillet and make the BEST omelette's ever! I even use it on my toast now instead of butter. 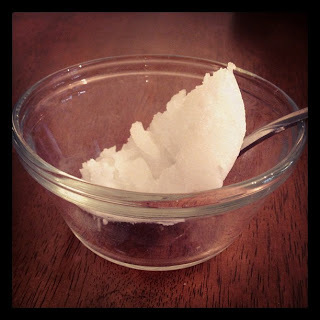 Here's a link to a website that gives TONS of ways to use coconut oil. Click on the following picture to go to yet another link about it's uses. Have you gotten on the coconut bandwagon yet? If so, what are your favorite uses? How about Dr. Oz? Do you love him? Hate him? If you hate him, please keep that to yourself. I'm not sure I could be your friend anymore if you did. Oh.... if you have any connections to get me in his audience, you'd be my forever friend!